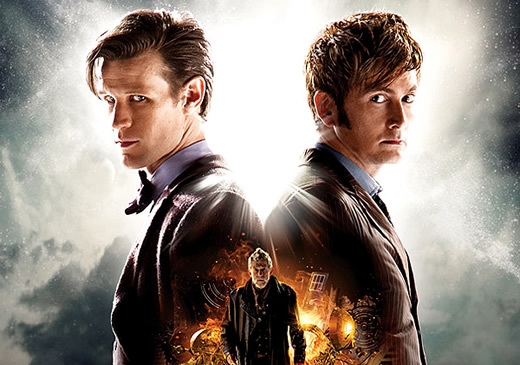 Why “The Day of the Doctor” made me forgive Steven Moffat for everything I didn’t like about his version of Doctor Who. Or: Good storytelling and how it can sneak up on you. So first things first: while I had no history of watching the classic Doctor Who as a young British child (yes, I’m well aware I never was quite such a British child) I flop-hearted nonsensical in love with Russell T. Davies’ reinterpretation of it. I watched it sporadically at first, more eavesdropping on my sister’s viewings than being willing to trust my heart to some wonky British show with latex and silicon aliens. was fresh-faced and eager, wholeheartedly willing to experience everything and yet tumbling with the knowledge that the universe was so much more than she ever would have imagined. And of course, the Doctor was wonderful. Funny. Madcap. Full of yearning, but not for anything nameable. And always, always impressive. I thought I would never love another Doctor the way I loved Nine. And then came Ten. And everything expanded and got better and hurt more and made me love it more. As much as I loved Rose Tyler? I wanted to BE Donna Noble. 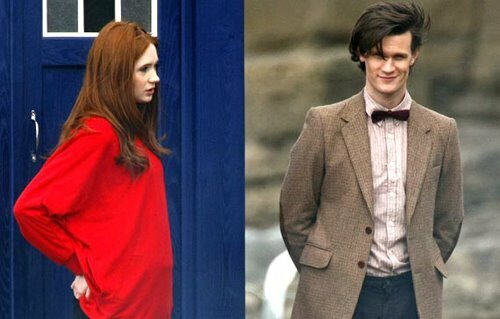 When they were both taken away from me (and of course by me, I mean the Doctor), I was heartsick, heartsick, heartsick. Satisfied in their storylines and loving the show for hurting me that much, but heartsick all the same. 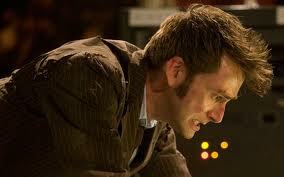 But not as heartsick as when I heard that both David Tennant and Russell T. Davies would be leaving the show. That seemed like too much to bear. In fact, I put off watching Tennant’s last specials for a full year, totally unwilling to move on to Moffat and Matt Smith. I thought that that would be enough time to prepare myself, but I was wrong. Tennant’s last episode destroyed me. And then there was Matt Smith. And… no one knew what Daleks were? Or any of the media-hey-day bits that Ten had gotten into? No one knew who the Doctor was? sure, but I felt distant from them. And where oh where was my Doctor? Naturally, I blamed Steven Moffat, new helm of the show, for everything. I felt as if he wanted to distance himself from Davies’ Doctor Who as much as possible. I could understand that, in a way, but as a fan I also felt kicked in the gut. So, so much of what I’d loved in the show was gone, and Moffat seemed to refuse to even acknowledge Davies’ reign, though he did reference the classic show what seemed to me a lot more (again, speaking as someone unfamiliar with the classic show, other than a viewing of The Curse of Fatal Death, which doesn’t really count). I saw this distance from the previous season as a slight betrayal to the fans of the more recent incarnation of the show, and as a big mistake on Moffat’s account. Eleven’s first season of Doctor Who was darker and creepier than I wanted to see, to be frank about it. While I’d been deliciously chilled by Don’t Blink just like everyone, I did not watch Doctor Who to be creeped out. I watched it to feel wonder, celebration of humanity, and hope in the face of everything. Still, I don’t give up on shows easily, and there was just enough of a glimmer of the Doctor I was familiar with to make me wait it out. Eventually, I’m not sure when or how, Matt Smith did grow on me a little bit. And bit by bit, it seemed like Moffat was willing to embrace the more recent history of Doctor Who. Rose Tyler’s name was even dropped out of the blue. It was great. The last couple of seasons, I admit, have been a lot of fun, and much more like what I fell in love with the show for. It seemed as if Moffat had learned from his earlier mistakes of distancing himself and was finally willing to embrace the feel of the show the way I had always hoped would happen. It didn’t quite make up for things in my heart, but I was happy to look forward to the future. That sound you’re hearing? Is my brain bursting with applause. Because with two lines, Moffat justified everything that I had disliked about his first taking on as the head hauncho behind Doctor Who. I’d already been leaning towards this thinking myself, after reading a fan posting I wish I could find right now, about how Ten was so, so human that it hurt him immeasurably, and in response, Eleven more or less drew away from everything about that life and forced it into a drawer to collect dust. Let me explain why I love this so, so much. 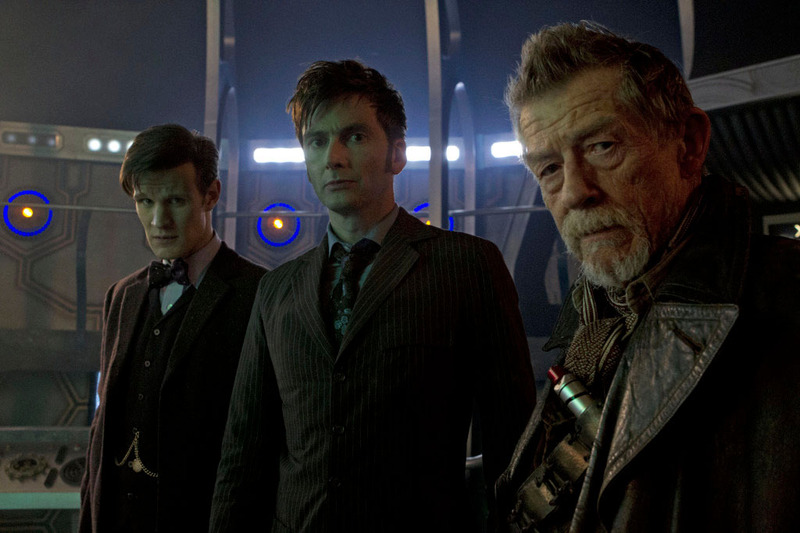 We understand from this that John Hurt is the “Doctor” (though he doesn’t call himself Doctor) in between Eight and Nine. 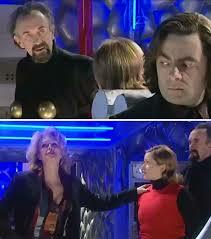 The one who destroyed Gallifrey. The one the Doctor does not want to remember being. He is the one that becomes Nine—the one Ten alludes to as having been “born of blood and anger and revenge.” As I said, the one who rages. Nine had a tendency towards anger, and was often fed up with humans (“stupid apes”) even though he would defend them to his last breath. If you look at this from the Doctor’s personal timeline, it’s likely he was angry at his own humanity—his ability to be at fault, or rather his inability to save his people in a way he could accept. But then there was Rose. This young girl who trusted him openly and was fallible and imperfect but was willing to offer mercy when even the Doctor could not. And that humanity the Doctor had been suppressing? All came flooding back in with his new regeneration. Ten was impossibly human. Formed attachments even when he thought he was protecting himself. And was always so, so sorry. I had been so mad at Moffat for forgetting about all those people Ten loved, but then Ten lost more people than it was prudent to remember. A love, a best friend, a pseudo-family, a possible wife, even a daughter (though I’m still hoping Genny will show up again). Even his greatest enemy! The weight of all the people Ten lost is astounding. And even after all that, he was afraid of letting it go and changing. So as Eleven, he forgot. Forgot his deeds on Gallifrey. Forgot Rose Tyler and Jackie Tyler and Martha Jones and Donna Noble and Mickey Smith and Captain Jack and every single person he could. Even forgot his current companions for long stretches of time. Ran further away than he ever had, only to run smack into himself. And now with Peter Capaldi coming in, it seems as if the Doctor is willing to admit that he IS an adult. That he’s done running away and hiding from everything, done regressing. Basically, storytelling genius. I won’t even go into how fantastic the uses of Billie Piper and Tom Baker were in the special, or how beautifully the story was resolved and set a new course for the show. That’s been said elsewhere, I’m sure. I still think Moffat made some mistakes when he first took on the show as Executive Producer, but like any really good storyteller, he’s taken those mistakes and put some sense to them, hiding that they were ever mistakes in the first place. There’s a lot to learn there, and I take my hat off to Moffat. I could not have been more pleased or impressed. This is old advice. It’s stuff I’ve been hearing and wanting to follow for years. I say wanting, because… well, I can’t say that I’ve ever been particularly good at it. It’s not that I avoid the stuff that scares me, exactly, just that it doesn’t come to me naturally. My main characters and their backgrounds and their personal demons—that’s cake. Bad guys are not my forte. It’s not that I’m afraid of them, exactly, it’s more that I don’t know how to handle them very well, so I avoid it as best as I can. Except you can’t exactly write a lot of genre without having to deal with one or two bad guys. I admit, this is a reason why it has taken me so long to get where I’m going. Because I knew that this story needed a better bad guy. But. But I did not know how to do this thing. A friend of mine ended up giving me a very basic bit of advice just from hearing the background of what my story was about—not to put too fine a point on it, she basically gave the advice that instead of inventing a wholly character-driven tale for my villain (note that I said wholly character-driven), I should use elements of the bigger themes in my story—in this case, namely, magic. And as soon as that little suggestion was made to me, a lot of what needed to happen involving my bad guy suddenly made a lot more sense. 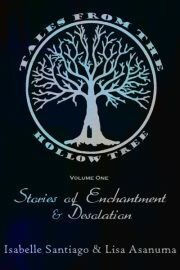 I knew how and why magic was a part of what made him bad, or why and how he was involved with magic, anyhow. And the way things do in stories when you’ve found the right idea—things sort of fell together with what I already had. But I was still a little afraid to actually get to the writing of it. This new angle involved not only interspersing scenes throughout the novel from the villain’s POV, but also inventing and introducing at least two whole new characters (I was going to do three, but now I think I’m good with two) and altogether altering a lot of my book. This post is meandering a little bit, but I won’t apologize for it. I’m also getting away from my posting schedule, but I thought a non-post-day post was better than no post. I’m still a long way from my goal of having my first round of edits done by the end of the year, but we’ll see. I have a new fire under my feet now, and that’s always a good thing. 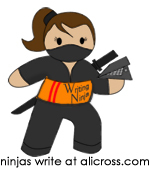 It’s halfway into the first week of NaNo, and even though I’m only half-participating this year (editing and overhauling my MS), I thought I’d do a blog post on writing. More specifically, on killing the cat. I know, I know, everybody likes cats. LOL or Grumpy or big or small, everybody likes them. The Egyptians worshipped them, and all. But guys, the cat must die. Have you noticed how lately at the movies—especially the big, blockbuster type movies—that while you may enjoy it for the various jokes or shenanigans, overall the plot just leaves you kind of.. eh? Like, you’ve seen that movie before, and you already know who’s going to come out on top of every scene before it happens? But we went to the midnight showing—or maybe 10 pm showing—and I was tired. For the first time since I was a kid, I fell asleep in the movie theater. But when I told my husband and my brother that, they laughed at me, because I fell asleep during the fight scenes. Ridiculous, right? That’s where the action is! I knew exactly how each of those battles was going to go as soon as they started. Sometimes I’d rouse myself mid-battle and nod and let myself close my eyes for another minute, because the fight was following the pattern I was expecting and so I didn’t really need to be paying attention. Somehow my subconscious knew that, and knew when I did need to pay attention—like looking just in time to see the Newton’s Cradle bit. Everything new and wonderful about that movie was the jokes and the effects and the character back story that leaked out bit by bit. Which yes, I admit, still made for a fun movie. But the plot turns did not do anything like surprise me. This is the same reason why so many people were bored with Iron Man 3 and why it’s only been the recent, funny Thor commercials that have gotten you excited (that’s not just me, right?). The culprit behind all of this is the widely-hailed book on screenwriting (that has been used to inspire lots of book-writing, too), Save the Cat, by Blake Snyder. The book is subtitled “The Last Book on Screenwriting You’ll Ever Need,” and gives pointers on exactly (in the terms of screenwriting, down to the minute) plot points and downturns and… well, everything you need for a plot, needs to go. And this is great. It really has helped a LOT of people write books. Or movies. Or whatever. But it also means that people, whether consciously or not, are getting used to the pattern, and getting bored of it. This is why things like The Game of Thrones and The Walking Dead are so popular right now. Because they subvert the expectations that people have—no one is safe, and no one is immune. Anyone could die. And that keeps readers on their toes. Now, I don’t have stories where people are dying all of the time, and most stories don’t. But the principals are the same. So the gist of this post? Okay, take advice where you want to. But don’t follow the advice to the letter if that’s not what’s going to work for your story. Yes, stories need high and low points. Yes, your character needs upswings and downswings. But sometimes something out of left field is what is really going to be remembered. Sometimes, you have to kill the cat.